Claggan Farm Vegetarian B&B sits in an elevated position with excellent views across Speyside, the River and the Macallan Whisky Estate. An utterly charming rustic retreat at very affordable prices. If you know anything about Malt Whisky, the Macallan Estate will need little introduction. This ever maturing estate has been at the forefront of malt whisky production for some two-hundred years. And although its swan-neck copper 'stills' may rank as the smallest on Speyside they pack one hell of a smooth punch. 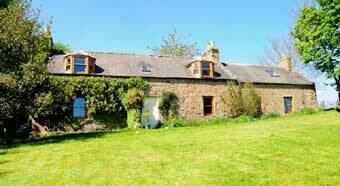 The same could be said of this 17th century farmhouse guest house, just a few miles from Aberlour on the north side of the River Spey. The scenery round here is stunning much and the Claggan capitalizes on its location exceptionally well. The guest house offers just two rooms: one double and one twin both. Both guest rooms come equipped with free WiFi Internet and tea and coffee making facilities. The two rooms share a bathroom, which is tiled and appointed to very high standard. The food is first-class and breakfast is served daily. The cook makes good use of locally sourced or home-grown organic produce, including homemade jams and preserves, free-range eggs and home-baked artisan bread. The villages of Archiestown and Aberlour are both within a 10-minute drive. If you like it quiet and peaceful, this is definitely the room for you.